Virology group of Institute of Agricultural Science (IAGS), University of the Punjab Lahore under the leadership of Prof. Dr. Muhammad Saleem Haider, Director, IAGS recently completed a Research Project sponsored by Pakistan Agricultural Research Board (PARB). Transgenic cotton was developed against cotton leaf curl disease complex using RNAi technique. Department of Cell and systems Biology, University of Toronto, Canada, Centre of excellence in Molecular Biology (CEMB), University of the Punjab, Lahore and Cotton Research Institute (CRI), Ayub Agriculture Research Institute (AARI), Faisalabad participated as collaborator in this project. The total funding of the project was 28.139 million Rupees. After excellent field results, the Institute of Agricultural Sciences submitted the findings for Patent registration at Intellectual Property Organization of Pakistan (IPO), titled as ‘ DEVELOPMENT OF VIRUS RESISTANT TRANSGENIC COTTON'. Transgenic seeds have been handed over to CRI, AARI, Faisalabad for multiplication. The studies to control Jassid ( Amrsca spp.) 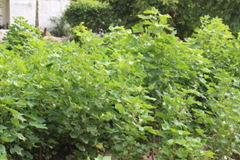 on the Brinjal ( Solanum melongena L.) through bio-pesticides and habitat management in Lahore Division. 6 Evaluation of Different Irrigation Schedule and Nitrogen Fertigation Levels for Improving Water Use Efficiency under Various Crops.